There is basic equipment required: a headset, a Dictaphone to play the tapes that must be transcribed, and patience, a willingness to become a human conduit as the words of others enter through her ears, course through her veins, and drip out unseen through fast-moving fingertips. I love books about the odd, the quiet, and the life made so strange by realization it suddenly feels unbearable. Books about the things often overlooked. 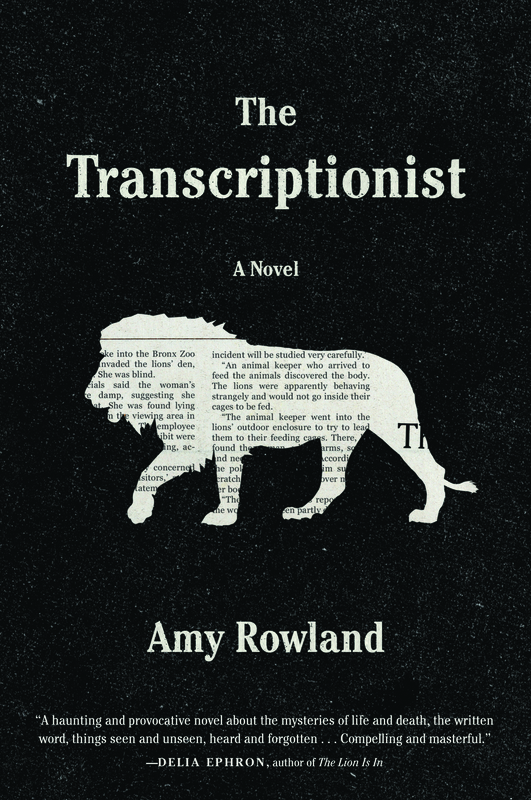 Amy Rowland’s The Transcriptionist is one of those books. It’s about pigeons silently sitting on sills, framing windows where much bigger action takes place. It’s about old men holed up in tiny corporate closets, doing work so unnecessary they almost don’t exist, elderly ghosts haunting big business machines. And most of all, it’s about a transcriptionist at a big New York paper. By definition, she’s on the periphery. This transcriptionist is a channel through which other people convey the world’s big tragedies. She transcribes lost limbs and babies drown in mud during slides. Reporters ring the row of telephones in the Recording Room on the Eleventh Floor, and by default her voice is muted as she listens, and they relay to her the desperate and wild happenings in the outside world. Only two reporters bother to call her by name, as they request transcriptions of interviews or call in from the field. One of those reporters has been calling her Carol for years. This transcriptionist, her name is Lena. She is, anyway you look at it, primed for a mental breakdown, or a moment of self discovery, or some big, great combination of both. And she finds one of those, I’m not sure which one, or maybe she finds both, in a soul mate of sorts. She meets an old woman on the bus. The old woman is blind, and she is a court reporter. They are alike, Lena and this woman, as they let the voices wash through them and come out their fingertips day after day. They have a brief encounter, these similar strangers on the bus. And then, Lena reads of the old woman’s death in her own paper. Business continues as usual, for everyone but Lena. For her, life will never be the same. Amy Rowland, The Transcriptionist‘s author, was a transcriptionist at the New York Times, which makes this book all the more delightful. It quietly crept onto the Washington Post’s Top 50 Fiction List for 2014, and would certainly make my top list for the year as well.